On the heels of HCC’s trip to Spain where students studied abroad and with another Study Abroad class in Italy planned, this seems like the perfect place to write about my experience in Europe. I was not in Spain, nor was I there for school but I still learned quite a bit. Back in 2006, I went out of the country for the first time in my life to visit family in Hungary. I was not staying in a fancy Budapest hotel, but with my relatives in the heart of the countryside. From day one, it was like being in a different world. My first experience with Hungarian culture was when my dad and I were throwing a baseball around on the first day. Two kids who were around my age were watching us from the window of their house. At the time, it never occurred to me that they had never heard of baseball. Once they came outside, my dad, who is fluent in Hungarian, was able to explain to them what we were doing as I only knew how to say “yes”, “no”, and “please” in the language. The two kids and I still spent a lot of time together during the two weeks playing soccer and video games. Even though they have a lot less than I do, their interests were very close to those of my own. They really enjoyed playing with my PSP. It was something brand new to them as they never played any versions of the PlayStation. It made me feel lucky to have what I have here in America. The choices of food were very different than what I am accustomed to in America. Chicken soup was a part of every dinner meal. The variety was not there. I had more chicken there than I do here in about six months. One night, we went to a resturant to eat. I had trouble deciding what to eat but finally chose a plate of spaghetti. I was looking forward to it until they brought it out and used ketchup instead of tomato sauce. This was a big surprise to me, as this would never happen in an American restaurant. In different cultures, they prepare dishes differently and I was not prepared for it. I really should have saved that dish for if I ever visit Italy. Photo by Jon Hicks/CORBIS. 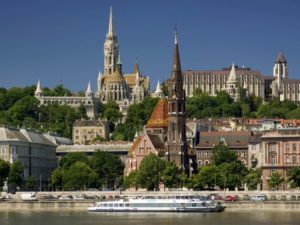 A picture from the Danube River shows some of the castles in Budapest. While there we visited places all over. We spent a day in Budapest, visited the zoo, and even spent a day at a waterpark. Budapest was a beautiful city. 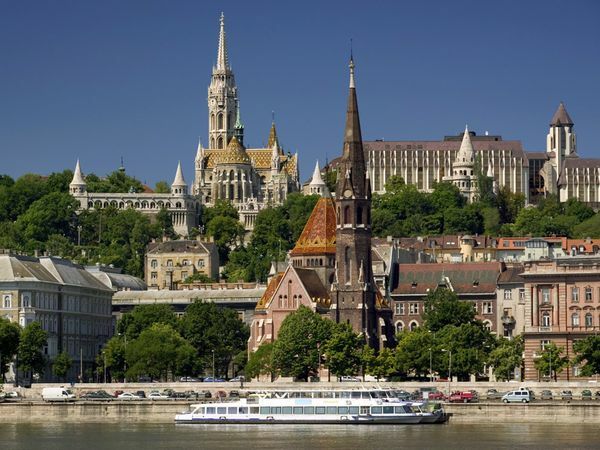 Divided by the Danube River, it was the perfect blend of modern city and historical city. On one side was the older half of the city. This side had a castle and all of the government buildings. Visiting all of the old buildings was a highlight for me as we do not have much of that in this area. The other half of the city compared to an American city. It had modern buildings and places such as McDonald’s and Burger King. The shopping mall was a big difference from what we have. There are no separate stores. Both floors were setup with stands with stuff to buy. The closest thing I have seen to the setup is the holiday store that my elementary school held every year. The zoo was the closest thing to American that I saw there. Some animals that they had are not seen in an American zoo, but at the end of the day, animals are animals. The waterpark was an interesting place. Sitting in a pool that has water from a hot spring right below it was a different experience, as usually green water is a bad thing. The choices of bathing suits were a bit different. Most of the men wore speedos, which is deemed weird here in America. Hungary and Spain might be on different sides of Europe, but Spain still has some of the things I mentioned. The only way to get the full experience is to go visit. In my two weeks in Hungary, I learned a ton about their culture and how they live their lives. It has taught me to really enjoy what we have here in America because the other side of the world is not as fortunate. Anybody that wants the full experience should seriously consider studying abroad. You will be able to travel all across a country and learn about their culture and see how they live their lives there. The only thing that you will not experience is living in a typical European home. Spending two weeks in a Hungarian home was a big change. The television only had four channels, which was a downgrade from the 300+ that we are used to. We also had to sleep with the window closed at night so without air conditioning, it was not the most comfortable environment. My dad did open the window one night and it was okay until several frogs jumped in to enjoy the home. When does something like that happen in an American home? We are all missing out.